PHOENIX (CNS) — The Knights of Columbus, long associated with swords, capes and chapeaus, will be going through a significant uniform change. The traditional regalia worn by fourth-degree Knights will be replaced, announced Supreme Knight Carl Anderson Aug. 1 during the international fraternal organization’s 135th annual Supreme Convention in St. Louis, which was livestreamed on EWTN. 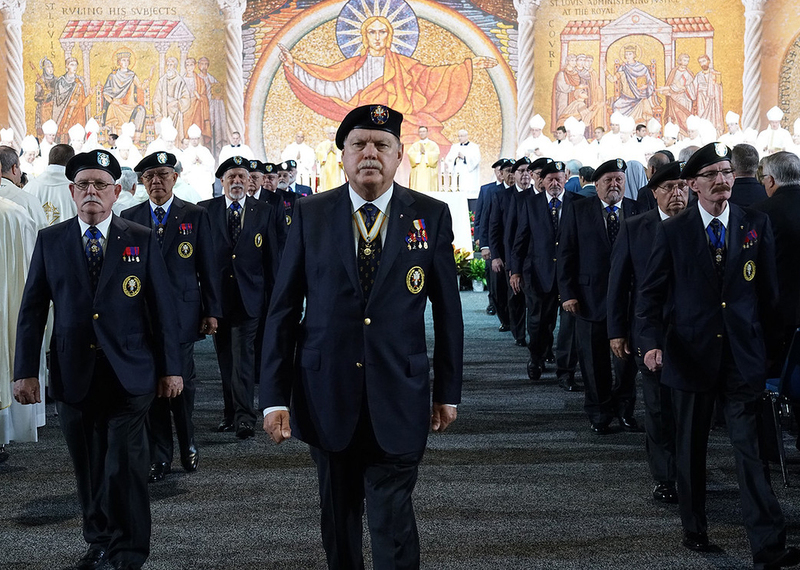 Throughout the years, the regalia of the Knights’ fourth degree, known as the patriotic degree, has gone through changes, Anderson said, noting that when this degree was first established, the uniform included white ties, top hats and tails. In place of a tuxedo with a black bow tie, members will be wearing a blue blazer, an official Knights of Columbus tie and a beret, all with the fourth-degree emblem on them, along with a white shirt and dark gray slacks. There was no mention if the swords would remain part of the uniform. Robert Earl, a member of the Father Novatus Assembly 23, which serves Our Lady of Perpetual Help and St. Daniel the Prophet parishes in Scottsdale, welcomes the new changes. “I feel it is significant that the order changes to respond to changing times. The new uniform evokes an image of elite military corpsmen in my mind, and I believe this is the intent behind the change,” Earl told The Catholic Sun, newspaper of the Diocese of Phoenix. Many members are not as thrilled about the pending changes, which generated some controversy among the membership. Joseph Meyer from Msgr. Bernard G. Collins Assembly 2899, which serves St. Bridget and Christ the King parishes in Mesa, said the new uniforms lose a sense of the pageantry associated with the Knights’ fourth-degree level. Meyer also expressed concern for members who own the current uniform and have to spend money on the new one. “If we get a new uniform like this, you will see a lot of Knights leave the degree. A lot of your Knights are retired and don’t have over $500 to spend,” he said. “The largest concern is people don’t feel that they have answers for the question of why the need for the change. They want something beyond a more modern look,” said Lee. Lee said many members he’s interacted with are excited about the changes because it brings the uniform “more in line with other military service organizations because it connects us as patriotic organizations.” There also are members who “don’t like change, so they’re already up in arms,” he added. “Then you have the sect of folks that feel that their voice was not consulted, (that) this sort of change should have taken place as discussion at the state council level and then brought concerns to the Supreme level,” said Lee, who countered that notion by saying conversations have been happening at all levels of the order about the need for change. Representatives of the Arizona State Council said it was too early to comment as program details and guidelines for implementing the new uniforms were still unavailable. Gutierrez is editor of The Catholic Sun, newspaper of the Diocese of Phoenix. A jacket and beret? How banal. The knights deserve better.